German Renaissance artist Hans Baldung Grien was extremely interested in witches and made many images of them in different media, including several very beautiful drawings finished with bodycolour, which are amongst the most exciting images of the Renaissance. Four Naked Witches, a Baby and a Cat; Die Hexen  or The Witches Sabbath, woodcut, 1510; Three Witches ; Two Witches (Städel Museum), dated 1523. The fascination with witches lasted until the end of his life, in 1544, the year before his death, Baldung did a woodcut titled the Bewitched Groom (Sleeping Groom and a Sorceress). His teacher, Albrecht Dürer, shared a similar fascination with witches, but visited the theme less frequently, and in a much more static way as in his woodcut Four Witches. 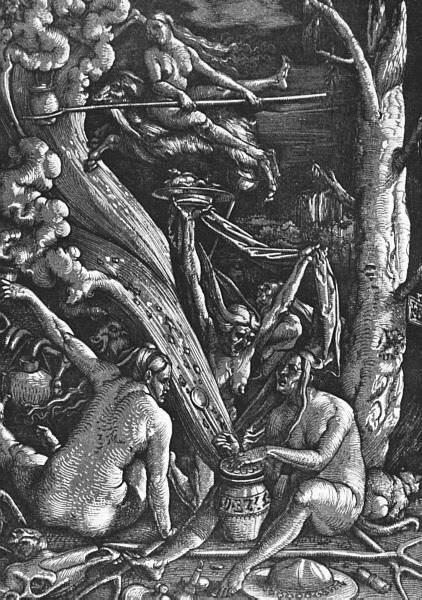 It is to be noted that the works by Baldung and Dürer were produced before the era of the witch hunts reached its peak. Unless indicated otherwise, the text in this article is either based on Wikipedia article "Hans Baldung Grien's witches" or another language Wikipedia page thereof used under the terms of the GNU Free Documentation License; or on original research by Jahsonic and friends. See Art and Popular Culture's copyright notice. This page was last modified 14:49, 14 April 2012.